It has been a busy few weeks around here. As you know, I was in Seattle recently for two functions. One was a SSBR lighting workshop as well as my nephews wedding not far from the Seattle area. For those of you living in the Seattle area or those of you traveling to the area, you need to check out Urban Light Studios! This was the location where I held my workshop, what a great place. The studio is more like a really cool house in a sense. Kevin Law, the owner of this place actually has two studios on site. The main floor has all sorts of neat places to photograph, room decorated in various themes as well as a full kitchen. The studio downstairs is more of your typical type of shooting space. By the way, they not only rent the place out to photographers, they rent there space out for all sorts of functions. Check out there space HERE. On Wednesday evening, the 18th, we had a social meeting and slide presentation at Kevin's studio. Thanks Kevin for all the snacks and wine your provide for the evening, your very kind. We had about 45 folks there for my presentation, it was nice meeting so many wonderful people. The next we had a nice group of participants at the workshop and a very nice young lady to model for us. Simone, you were charming and thanks for participating in the workshop. Here is the set up for the following photo. I used a single SB-800 in my FourSquare and a reflector place just below the frame. I shifted my color balance to tungsten and than placed a full CTO on the flash for a normal skin tone. 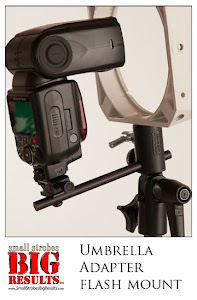 I might add, I always have an 1/8 CTO on each of my strobes. That 1/8 CTO is placed on everyone of my flashes, I feel that this 1/8th CTO brings my flash to a normal looking light. So, with that said, I actually have 1 and 1/8 CTO on the flash in this picture. Here is another image of Simone using this same shift in white balance to tungsten and CTO combination. I used a sliding plastic door as my light source. The SB-800 was place behind the door and was fired using a Pocket Wizard. In this next photo, I placed a single SB-800 outside with a full CTO and aimed it through the window. Once again, it is actually 1 1/8 CTO on the flash. My white balance was daylight. I'm very excited to be coming to Seattle! 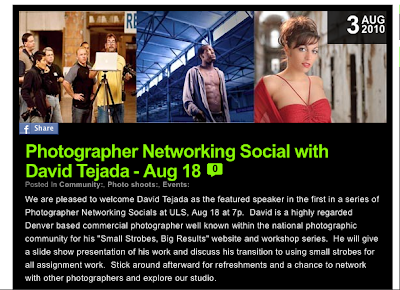 I'll be conducting my Small Strobes, Big Results workshop on Aug. 19th and a speaking engagement on the 18th. I'll be speaking and showing some work at the in Seattle on the evening of the 18th. This event is open to the public, however you need to RSVP if you plan on attending. You can RSVP at info@urbanlightstudios.com We only have space for about 125 people so please RSVP early.